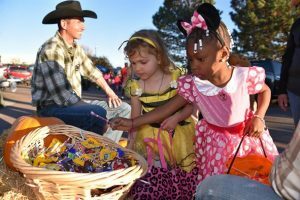 Halloween trick-or-treating is a joy for many children, but it often comes with several concerns for parents. What type of candy are they going to come home with? Are they going to eat too much candy and cause irreparable damage to their teeth? Fortunately for parents our Pediatric dentist in Columbus has several ideas to keep cavities away after enjoying the candy. Use Halloween and all the extra candy as one of those teaching moments for kids. Teach kids about the importance of brushing and flossing. Children need to learn about the amount of sugar in the candy and how it can lead to cavities and other problems for their oral health. Another thing you can do is help kids to reduce the amount of treats they consume. Set a rule on how many treats they should be able to eat in a day. Once they have reached a certain number of treats, have them put the treats away for the day. Another way to help with limiting the treats is to have a small jar for each child and place only the allotted number of treats in each jar, keeping the large amounts of treats from being eaten all at once. When you are dealing with candy, it’s natural for children to want to eat them day and night. Candy can leave behind too much sugar, which can be breeding grounds for bacteria and plaque. One way to help your child with the brushing problems is by letting them select their own toothbrush. You might even try getting a Halloween themed toothbrush to remind them to brush frequently when they are eating candy. If your child does indulge in some sweets, you need to make sure they understand how to brush and floss their teeth. Candy can easily become lodged between teeth, making it easy for bacteria to start eating away at the enamel of the teeth. Children learn by example. If you want to help your kids, teach them the importance of a healthy, balanced diet. When kids become used to eating carrots as a snack, they may not have a strong desire to indulge on candy as much. Another option is to replace their candy with healthier snacks they enjoy. The truth is, when it comes to candy, kids are always excited. If you teach your child how to brush and floss daily, it will aid in limiting the risk of cavities and other oral health concerns. Visit your Pediatric dentist, Hines Little Smiles, in Columbus, OH by scheduling an appointment for your child.